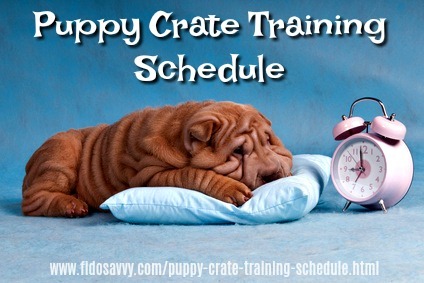 A consistent puppy crate training schedule is important because puppies thrive on predictability and learn by repetition. A regular daily routine (for meals, potty breaks, nap, playtime and training) is important. 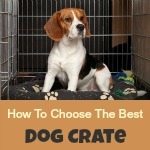 The handy crate training schedule on this page will help you housebreak your puppy quickly, and easily. Building your puppy's days around a fairly regular (but flexible) routine speeds up the housebreaking process. 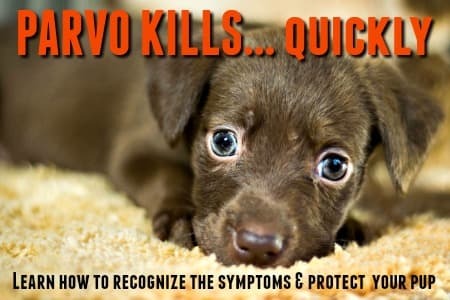 This is because it regulates little Fido's body clock and 'bodily functions'.... making it easier for you to figure out when he'll need to pee or poop. Try to feed your puppy at roughly the same time every day. You don't need to carry around a stop-watch and time it to the minute, but aim for a variation of no more than 30 - 45 minutes. While you're housebreaking your new pup, try to ensure that you and Fido are on the same basic schedule for when it's time to get up and go to bed. During the night-time it's not unusual for a pup to need to 'go' at least once, sometimes twice. Usually this would be about 3 - 4 hours after going to bed, and perhaps once more depending on how early you get up in the morning. Keeping expectations realistic and sticking to a routine are the keys to success! Your average 8 week old puppy will need to eliminate approx. every 30 minutes to an hour, immediately after waking up, eating, drinking, taking a nap, playing... and so on. Yes, you're going to be making a LOT of trips to his wee-wee spot, but that's absolutely normal and necessary. One of the keys to successful housebreaking is finding a way to prevent your pup from having potty 'accidents'. This is because habits take root fast, and sometimes it seems that bad habits do so faster than good ones. 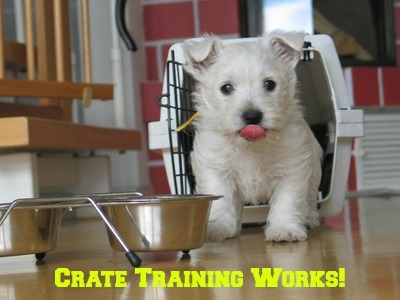 Using a crate is the perfect way to do overcome this problem, and an appropriate puppy crate training schedule is an important part of this. The vast majority of puppies, and older dogs, will do their very best not to pee or poop in their crate. 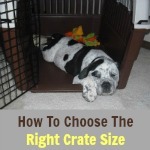 In my experience, crate training can be nothing short of miraculous IF you do it right. As long as you don't leave your pup crated for longer than his bladder/bowel control can handle, using a dog crate will help him learn to 'hold it' for short periods. Plus he won't be able to disappear from view and pee on the Persian rug, or sofa, or bed etc. A big plus, believe me. A predictable daily routine doesn't just help your pup physically, it also lets him feel secure in his new environment and encourages self-confidence. Something as simple as sticking to a regular schedule can make an anxious, homesick little pup feel a bit less worried. 07:00am Get up. Potty break. Playtime in crate. 07:30am Breakfast. Potty break/walk. Crate for play/nap. 08:00am Playtime. Potty break. Nap in crate. 12:30pm Lunch. Potty break. Playtime. Potty break. Nap in crate. 09:00pm Potty break. Playtime. Potty break. Nap/play in crate. 02.00am - 7:00am Potty breaks as necessary. But do remember, every single puppy is unique and some have much better control than others. 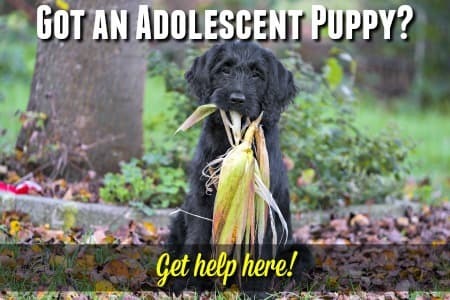 As you get to know your new pup better, you'll come to understand his body language, habits and abilities - then you'll be able to adjust the schedule above to suit his unique needs. In it's raw form this schedule is simply a guide, but one that I hope gives you the 'big picture' view and a jumping off point. It might help to know roughly how many times your puppy needs to be taken to his potty spot daily. Of course, YOU also have needs, and already have time commitments and a routine that works for you and your family. Things will run more smoothly once you manage to 'sync' your pup's daily schedule with your own. Obviously your little guy also needs lots of one-on-one time with you outside of his crate. Play times, walks and training sessions, but whenever he has free-run of your house you must supervise him carefully. Puppies can sneak off and pee/poop in a corner or under a table inside a minute. Small breeds are already so low to the ground (and their piddles so tiny) that they can squat and pee, then move on within seconds... and you won't realize it until later. The more accidents your pup had the more problems it will cause in his potty habits. Consistency, containment and supervision are all important.